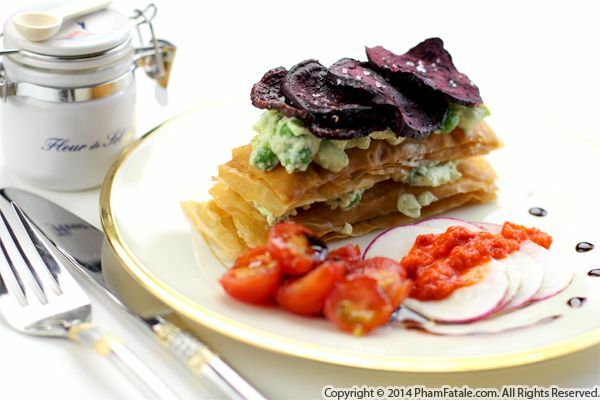 This savory Napoleon dish is heavily inspired by my childhood BFF's homecook expert a.k.a her husband Olivier. They came to visit us in the Bay Area right before we came visiting them in their new Parisian apartment last night. Olivier briefly told me about his savory creation which he calls "mille-feuille de betterave et petits pois" (literally "beet and green pea napoleon") in French. He went on to explain that he prepared green pea-flavored ricotta cheese filling in between thinly-sliced beet layers. I interprated my own version as I didn't have detailed instructions and added phyllo dough as a nice contrast in texture. I also added basil and ground cumin to the ricotta for extra flavor. For additional color, I garnished the first course dish with colorful vegetables from our garden: freshly-picked radishes, bell peppers and cherry tomatoes. I'm not sure Olivier was aiming for the same result but what I can assure you is it was delicious. I can't believe my European trip is coming to an end already. I''ll be heading home soon for more book signing appearances. My next ones are taking place at Barnes and Noble. Please mark your calendar if you're in the Bay Area and be sure to stop by Barnes and Noble Blossom Hill, 5353 Almaden Expressway, Building B in San Jose, California. I'll be doing a cooking demo, followed by a book signing on July 5th at noon. Quinoa is a fabulous side dish that contains no gluten. This gives you other options besides pasta and rice. Last night, I prepared it with beets. It added a beautiful color and subtle sweetness. 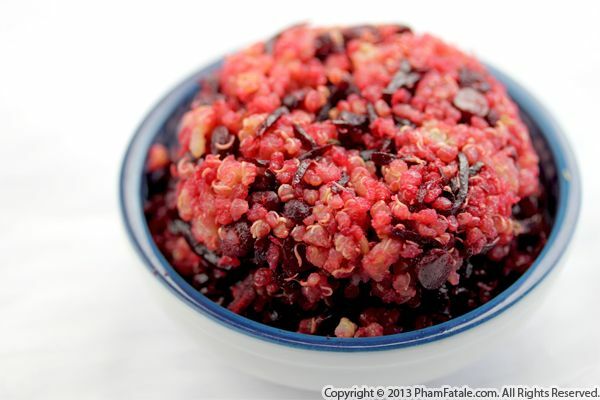 I usually like to add beets to plain, bland food; they revive the most boring dishes and aren't complicated to cook. Simple shredded beets cook extremely fast. Baby Aria is so talkative now and her thirst for knowledge is growing everyday. She always asks what she's eating. She loves how "funny" the word quinoa sounds and she adores beets. I bet she's going to request more of this dish in the near future! I love the flavor combination of beets and sage; I've used the same marriage of flavors in soups, pasta dishes and vinaigrettes on multiple occasions. This time, I made a variation of a polenta appetizer and flavored it with this particular pairing. 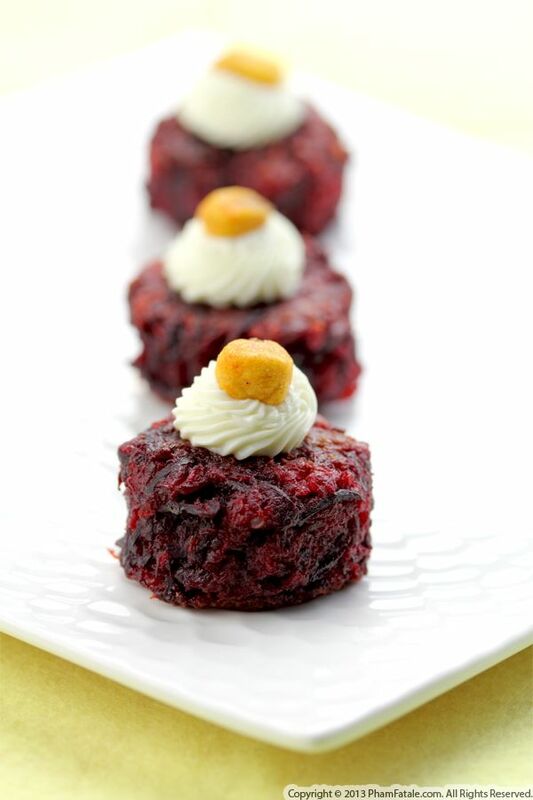 The beets gave a regal color to the bite-size portions and I repeated the sage flavor in the cream topping. The corn nugget garnish was my "cherry on top" and was a reminder of the cornmeal used for the polenta. You’ve probably noticed over the years that our family hosts a large number of dinner parties. My favorite part is creating new appetizers because it really levels the playing field for me. First I come up with a flavor combination that I know works incredibly well as my basis, then turn it into a miniature, aesthetically pleasing, unique piece of art. You know the saying: you eat with your eyes first! It's almost that time of the year again and I'm ready to prepare a horror-themed dinner for the end of the month. I concocted a gory-looking dish using the elegant combination of mozzarella, garbanzo beans and beets. I figured the color of the beets looked very similar to blood and I paired the dish with mozzarella and olives to resemble blood-shot eyes. Spooky! First, I soaked garbanzo beans and shredded raw beets. I cooked them together until the legumes were softened enough to be crushed between my thumb and index finger. 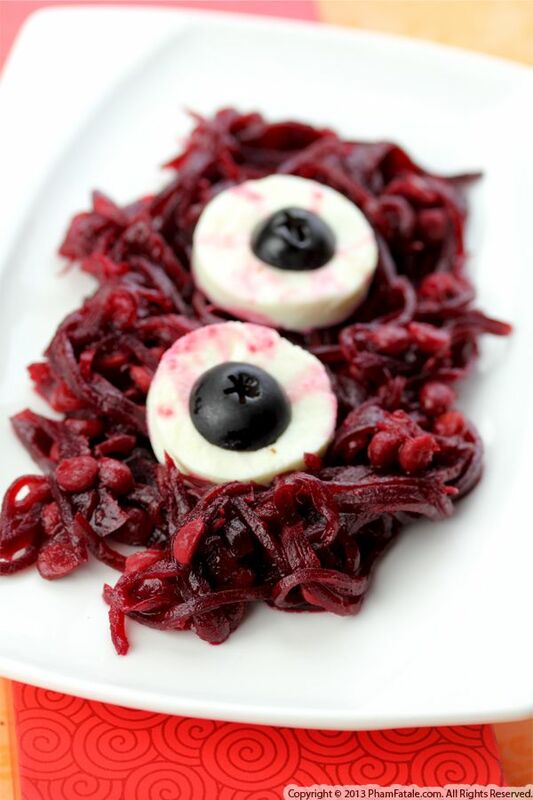 Once the beet dish was transferred to a serving platter, the finishing touch was adding creepy eyes made of cheese and olives. So it's not that difficult to feed your Halloween fun! Here's a fusion version of pizza made with spicy beets. 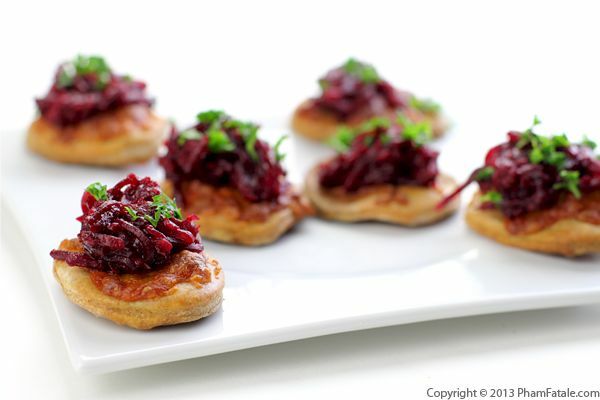 The pizza dough is baked separately then topped with Indian beets and dal. It's perfect for vegetarians since it's packed with protein. I usually serve them as appetizers. They would also be a great addition to a party platter because of the pop of color and exotic flavors.